On Monday morning we took Ducky the dinghy into the Seaman's Church Institute for one last time, took a shower and had breakfast at the cafe - a full breakfast for $5 each. Then we motored back, secured Ducky on the stern and left Newport Harbour, vowing we would come back. The night before we had heard an insistent banging on the hull around 8:30pm and when we poked our heads out into the cockpit, the Harbourmaster boat was alongside. The woman on duty seemed surprised we were there and wanted to know when we had arrived. I think she was all set to harass us, thinking we had slipped in and were trying to avoid paying. After a few minutes it became clear the Harbourmaster on duty a few nights earlier had forgotten to log we were there and had paid. Then to confuse matters, he had moved us from one mooring ball to a second one on the second day. We told her how we had paid for two nights and he had said not to worry if we stayed a third, someone would be by to pick up the fee. After explaining all this to her, as well as where we were from and where we were going, she apologized and said she would be back with a receipt book. About 20 minues later she was back and really apologetic. She had found a note her colleague had left for her explaining he had forgot to log it, but we had paid for two nights and might stay a third. We paid for the third night, and then chatted with her about our trip and about Newport. She recommended coming back in the fall. We noted there is a boat show in September, so maybe we will try to come back at some point during the boat show. Whenever we do make it back, we are determined to tour some of the mansions. As we left Newport, the weather was warm, but the wind was fairly light. We ended up having to motorsail again. 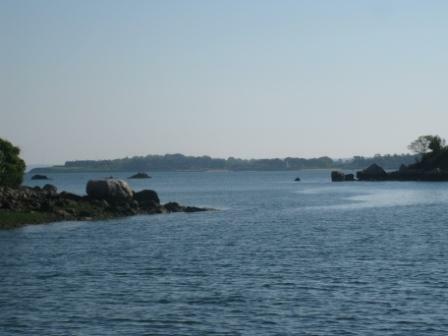 We crossed Buzzard's Bay without incident and entered Hadley Harbour. 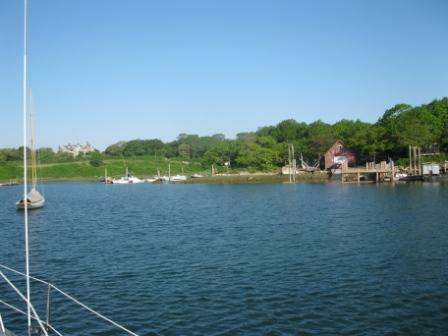 Close to Woods Hole, this small harbour is a hurricane hole and we can understand why. It is well protected from all sides. The entrance is very narrow and as usual I was terrified we would run aground, but there is lots of water - at least 12 feet under our keel. There were about 20 free mooring balls and it is first come, first served. There were about 5 other boats with people aboard in the mooring field. 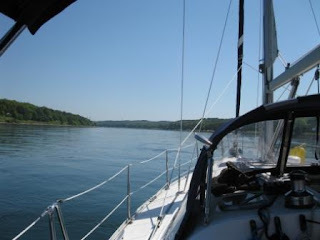 We took a mooring, cooked dinner, drank a bottle of wine and relaxed in the peaceful anchorage. Internet was very sketchy as we were just on the edge of a signal and as the boat swung gently on the mooring we would pass in and out of range. This morning we were up early and after a shower and breakfast, we cast off the mooring and headed out into Buzzard's Bay towards the Cape Cod Canal. We needed to time our passage in the Canal to coincide with the current which can run 3-4 knots. The weather was beautiful. The wind was light so we motorsailed for about two hours as we wanted to make sure we caught the current in the right direction. At one point, while I was on the wheel I asked Jay about a large boat on the horizon. He agreed it looked like a freighter with a tall white stack and a red hull, remarking it had likely come out of the Canal after catching the current from the other direction. I kept a wary eye on it as we drew closer. My mind kept flashing to all the stories I have read about freighters colliding with sailboats with disasterous consequences. I noticed we seemed to be getting closer and although I was out of the shipping channel, it seemed to be on a collision course. I altered my course and kept a watch. We had been listening to the weather on the VHF and I was now worried we should flip to the commercial shipping channel 13 or 16 to see if we were being hailed. That boat seemed to be right in our path! I brought it to Jay's attention again and he looked up from his book. At which point, he started to laugh. 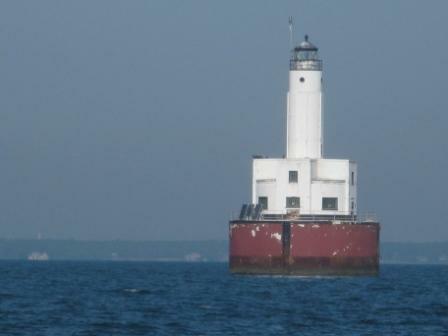 "It's a lighthouse," he said. Boy, did I feel foolish. I was immediately reminded of that old story where the naval ship keeps telling another ship to avert their course and get out of his way, only to find it is a lighthouse. I guess I should have looked at the chart too - not just relied on Jay! 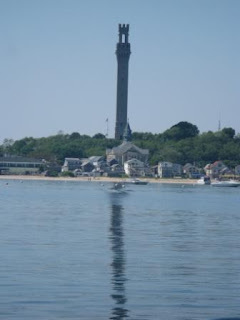 These lighthouses out in the middle of the water fool me everytime. We furled the sails and entered Cape Cod Canal and the boat picked up speed. Without even running the engine hard, we were doing 10 knots. Walking and biking trails run along both sides of the Canal and many people were fishing along both sides. 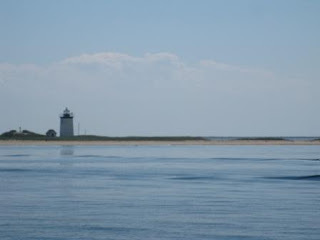 It took just under an hour to traverse the Canal and then we were out into Cape Cod Bay. Although the wind picked up to a respectable 8 knots, it was completely on our nose as we headed for Provincetown. I made some canneloni and garlic bread for lunch and we ate at the cockpit table while Otto, the autohelm steered us towards our destination. It was about 3pm when we arrived in Provincetown and picked up a mooring from the Provincetown Marina, $35 per night. We released Ducky from his holding place on the stern and motored to shore to pay for the mooring, pick up a few groceries and explore. We had been here once before for a day about 15 years ago, not that we remembered anything. The streets are narrow and lined with shops, bars and restaurants of all kinds. But tonight we are eating aboard. Grilled steak on the BBQ. Yum!